The Crested Butte Wolfpack hockey team advanced through the first round of the post season with two blowouts over Grand Junction. and is one step closer to reaching the state tournament. 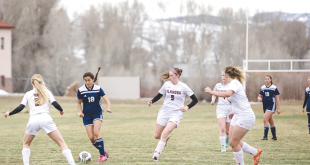 The Wolfpack entered the playoffs the number two seeded team and faced the number seven seed Grand Junction on Saturday, February 16 in Gunnison. Last year, the Wolfpack was in a similar circumstance and was handed a serious blow, losing in the first round to Oak Creek. 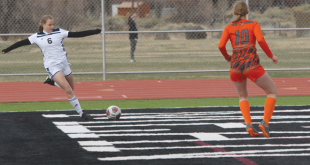 This year, the team’s maturity shone through in the first round as they remained focused on the task at hand and defeated Grand Junction in two games straight, 9-1 and 8-2. John Tharp led the team with five goals in the first win netting his first one just 53 seconds into the game and then scoring the next two Wolfpack goals in the same period for the natural hat trick. Robbie Holleran gave the Wolfpack a 4-0 lead, scoring the final minute of the first period and the Wolfpack added four more goals in the second period for an 8-0 lead. Both teams got a goal in the third period with Holleran finishing his hat trick with a short-handed goal in the seventh minute of the final period. Tharp opened the scoring for the Wolfpack in the second game scoring three minutes into the game. Jenner Currier sneaked in on the far post to punch the puck through for a 2-0 Wolfpack lead and Connor McGuire put the Wolfpack up by three goals, scoring in the eighth minute of the first period. Grand Junction broke free for a number of shots, including a one-on-one in the final three minutes of the period, but Wolfpack goalie Zach Van Dyke was stellar in net with a series of saves to hold the Wolfpack lead. The Wolfpack opened the second period sluggish until Tharp stuffed a one-on-one top shelf for a 4-0 Crested Butte lead. Sam Evans skated through three players to open up a shot from the high slot that slipped past the Grand Junction goalie and Eric Jernigan scored 10 seconds later to put the Wolfpack on top 6-0. Tharp netted his third goal of the game, eighth of the weekend, in the second period and Holleran scored in the third period between two Grand Junction strikes for the 8-2 win. Aside from all the goals, coach Phil Martin liked what he saw out of his defense, handcuffing the Grand Junction offense, especially their power-play, in both games. “We held them to very few shots and were aggressive on our penalty kills, which was good to see,” says Martin. About the only downside to the weekend came in the second game when Wolfpack player Kyle Hecker suffered a deep gash to his leg that may sideline him for the upcoming games. The Wolfpack qualified for the final league tournament and will join Moffat County, Durango and Gunnison in Grand Junction Saturday and Sunday, February 23-24. Current weather patterns pose the biggest problem for the Wolfpack now as they prepare for the upcoming tournament. They will enter the tournament as the number two seed out of four teams and face the number three seed team Moffat County on Saturday at Glacier Ice Arena at 2:30 p.m. The winner of the tournament will then advance to the state tournament Friday through Sunday, February 29 through March 2.